Well, looks like maybe we will be a couple of days without rain now and hopefully see the sun. I captured this image this morning, just about 30 minutes ago. 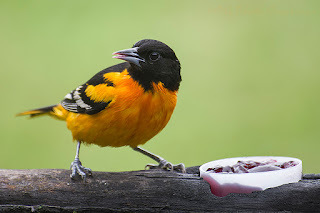 The Baltimore Orioles are back in full force this year, we have at least 3 pairs that come to feed at the liquid feeder and the jelly.The Mulberries are ripening so I am wondering if they will keep coming but we shall see. They did last year. This is a beautiful male enjoying a jelly breakfast.